The California legislature just scored a huge win in the fight for open access to scientific research. Now it’s up to Governor Jerry Brown to sign it. Under A.B. 2192—which passed both houses unanimously—all peer-reviewed, scientific research funded by the state of California would be made available to the public no later than one year after publication. There’s a similar law on the books in California right now, but it only applies to research funded by the Department of Public Health, and it’s set to expire in 2020. A.B. 2192 would extend it indefinitely and expand it to cover research funded by any state agency. EFF applauds the legislature for passing the bill, and especially Assemblymember Mark Stone for introducing it and championing it at every step. A.B. 2192’s fate was much less certain a few weeks ago. Lawmakers briefly put the bill in the Suspense File, a docket of bills to be put on the back burner because of their potential impact on the California budget. Fortunately, the Senate Appropriations Committee removed A.B. 2192 from the file after EFF explained that its fiscal impact would be negligible. We hope that the governor signs A.B. 2192 and that it becomes a model for similar bills around the country. 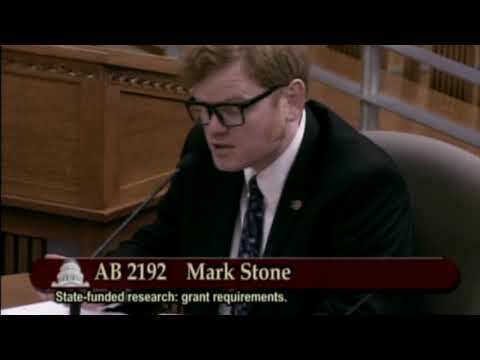 As I said when I testified to the California Senate about the bill, the traditional system for publishing scientific papers puts researchers who can afford expensive journal subscriptions at an advantage over those who can’t. While California can’t do anything to stop that disparity for most scientific research, it can and should find ways to make sure that research funded by the state doesn’t exacerbate it. While we’re delighted to see A.B. 2192 pass, it’s only one step in the right direction. Science moves quickly, and a one-year embargo period is simply too long. Lawmakers should work to ensure that more grantees publish their papers in open access journals, available free of cost to the public on the date of publication. Lawmakers in California and elsewhere should also consider requiring open licenses in future laws. Requiring that grantees publish research under a license that allows others to republish, remix, and add value ensures that the public can get the maximum benefit of state-funded science. Finally, it’s time for Congress to pass a federal open access bill. Despite having strong support in both parties, the Fair Access to Science and Technology Research Act (FASTR, S. 1701, H.R. 3427) has been stuck in Congressional gridlock for five years. Take a moment to celebrate the passage of A.B. 2192 by writing your members of Congress and urging them to pass FASTR.